I could not buy this book fast enough after hearing David Sedaris read an excerpt from it on This American Life last fall. After receiving my online purchase in the mail, life’s busy routine prevented me from really enjoying it. So, when flying from San Antonio to Pittsburgh in July I took this book with me. Talk about guilty pleasures. I laughed so hard inside and out. All the while I kept glancing over my shoulder as if my dearly departed mother was going to catch me and give me a dirty look. It’s too well written to be “bad” but, oh my, it can’t possible be “good”. The hours I spent stuck in the middle seat flew by, no pun intended. With chapters like Adult Figures Charging Toward a Concrete Toadstool, you get not only entertainment but an interesting prospective on art in everyday life. I’m sure this is one book I will pick up again and again to read this section or that. No need to read the whole thing through to get enjoyment but once I pick it up I doubt I’ll want to put it down. Talk about escapism, this one is over the top. Set in the Great Depression this book’s cast of eccentric characters includes con-artists, circus side show performers, immigrants, and wealthy businessmen who all get entangled in a deadly mystery. With in a little bit of magic, a few elaborately staged seances, a budding young love story, and an albino or two this story takes it’s readers on a roller coaster ride. With no lack for drama the plot crescendos to an explosive fourth quarter and finishes with just a hint of mystery. Bestselling author Anita Shreve brings readers back to the New Hampshire coast house featured in The Pilot's Wife and Fortune's Rockers. This story is told through the splendid development of a handful of characters. As we get to better know them, and they each other the storyline progresses. 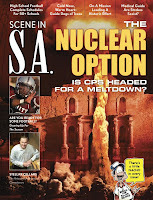 Set in the winter of 1920, I was able to escape one of the hottest summers of recent Texas history even if only in my mind. I'll spare your the details and make just one suggestion. This touching story is best suited to a long quite read, whether it's on a warm summer afternoon in the park or a cold winter morning curled up on the coach. 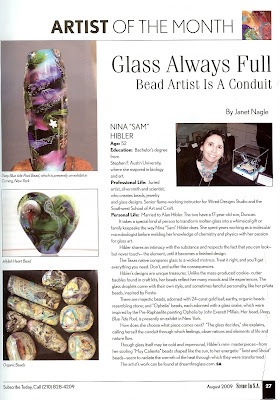 Scene in SA's August issue is out on newsstands and includes a two page spread on Dream Fire Glass artist Nina "Sam" Hibler. 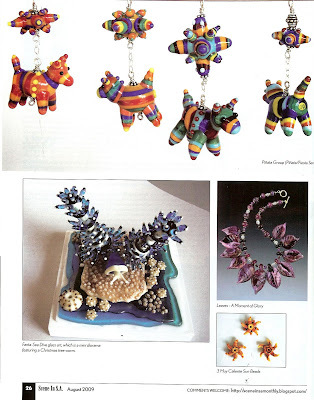 The article includes a brief overview of her recent work including Pinata Donkeys and Muy Caliente beads. It also delves into Sam's own special relationship with glass, the "wicked mistress". "Treat it right, and you'll get everything you need. Don't, and suffer the consequences." As I get ready to work I put on a comfortable old pair of jeans, slip into a pair of leather work shoes and grab one of a half dozen pair of safety glasses that sit strewn across every work surface. Then with my bare hands I start to pull the glass I will work with that day. I have worked for years with my bare hands safely and without incident. This is not uncommon. Of all the glass artists have met it has been rare to see anyone wear gloves except in specific circumstances like opening an operating kiln or charging a vitrigraph pot. You respect the material, work smart and use common sense, and for the most part they cuts you endure are scratches no worse then a paper cut. However recently I learned the impacts that can occur in just an instant due to an accident. My hands may not be pretty but they are precious to me. Seeking to provide them with the appropriate level of protection I began the search for the right pair of work gloves. Finding gloves wasn't hard. They are everywhere from your local hardware store to a marinade of online distributors. But I didn't want to buy just any pair of gloves. After all if you’re going to do something, do it right. I knew a "cut resistant" glove would not suffice as injury could occur from not only slicing cuts but also puncture/impact cuts and abrasion. The gloves I was looking for would have to be cut, puncture and abrasion resistant. At the same time I did not want them to inhibit my mobility, flexibility or comfort. I know I'm picky. Isn't everyone? This first thing I noticed was that a gloves resistance is rated with levels ranging from 0 to 6, 6 being the highest level of protection. There are three standards of measurement. The ASTM F1790 is a U.S. standard, the ISO 13997 an international standard and EN 388 the European Standard. Each one has its own manner of testing. I’ll spear you the details just keep in mind variations in testing can make this measurement relative. In short, it’s useful but should not be the sole determination in your decision. Look closely at the type of material the glove is made of. Metal Mesh and HexArmor provide the highest level of cut resistance, followed by Fiber-Metal blends like Kevlar Steel or Dyneema. 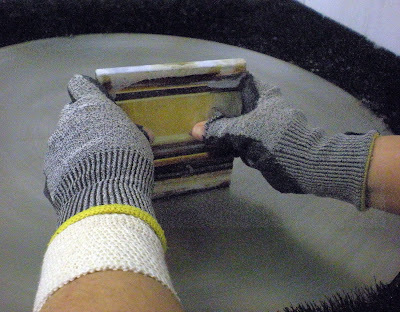 Materials commonly used in work gloves also include Kevlar, Vectran and Twaron. These materials are five times stronger then steel. Kevlar is also known to provide protection from heat an added bonus for a glass artist. Looking at a pair of cotton, leather or latex gloves? Keep looking. Although they may appear substantial the level of protection provided by these materials is minimal. Material choice is one of the most important factors. Also consider the weight of the material, the tightness of the weave or thread count, and any coating applied to the fabric like nitrole or latex. All this is starting to sound a little to complicate for just a pair of gloves. Call in the professionals. The turning point in my decision took place when I spoke directly with manufactures. It was the HexArmor Representative who impressed me the most. He asked a host of questions to evaluate my specific needs. What did I do? How did I work? Did I need protection from the glass, the machinery or both? And to all this I added I would need to be able to use these gloves wet and dry. Considering all this he recommended 9010 from HexArmor's level six series. Levels six, that’s was a good start. They are made with Hexarmor, a material ranked right up there with metal mesh for its protective qualities. 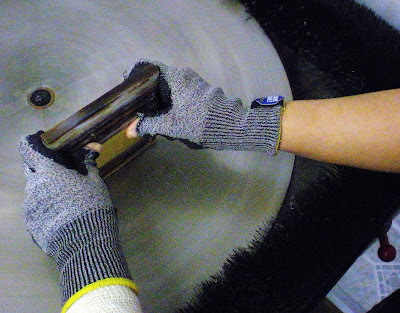 The palms of the gloves have a cut resistant shell with a nitrile coating to increase grip. I was Sold. The moment I hung up the phone I got online and purchased a pair. I am very happy with my gloves. I have made a few minor adjustments for my own personal use, which you may notice in the photo. Let me explain. I have small hands, specifically short fingers. I ordered the smallest size glove available and the fingers were still a ½ inch to long. This coupled with the need to feel a piece while I am working lead to my decision to cut the tips of the fingers off. I am fairly sure the manufacture would not support me in this decision. When cutting the gloves I made sure only to expose the very tip of the fingers, getting ride of that excess ½” of material while leaving the vital parts of my fingers and hand as protected as possible. I then sewed the edges so they would not fray. By opening the glove I risk something can get inside or I could cut the tip of a finger. At a personal level, I’m comfortable this is right balance of protection and flexibility for me.